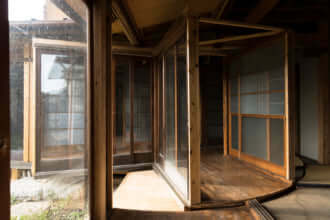 Architect Ryue Nishizawa is famous for creating buildings with a totally exploded structure (Moriyama House for instance). His latest challenge was a sizable one, but once again, Ryue has succeeded. 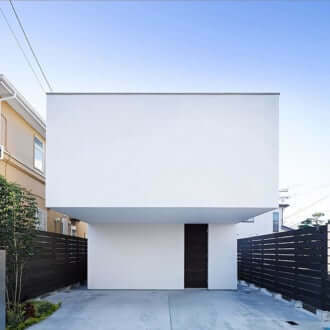 The site for this house in Tokyo was just four metres wide, tucked between two big buildings. To avoid reducing the inside space even further, he had an idea: to build a wall-less house. 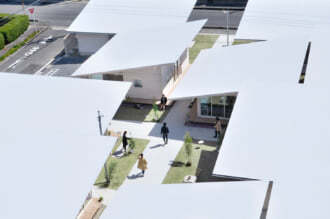 ‘The entirety is a wall-less building designed to provide an environment with maximum sunlight despite the dark site conditions’, the architect explains. Each room has plants and a small garden of its own to shield it from prying eyes (the long curtains also serve this purpose). In all, the house covers five floors, but an area of just sixty-six m2. And makes you feel a little dizzy. It even has big glass windows. The illusion works, doesn’t it?